You may have been to every place in Moscow and St. Petersburg, but you haven't scratched the surface of what Russia has to offer. Lenin’s Mausoleum on Red Square, Christ the Savior Cathedral and the Tretyakov Gallery are featured in any Russia guidebook, but this huge country has many more interesting things to see that remain hidden from the average visit. Lake Baskunchak. The Russian version of the Dead Sea, it is located not far from the city of Astrakhan and forms a large depression on the top of a salt mountain. The name Baskunchak translates as “dog’s head.” According to one legend, a caravan of merchants once got lost in this area. One of their dogs saw the lake and began to drink from it, but the water was so salty that the animal died instantly and fell in; only its head remained above the surface. The lake is indeed salty, with salt concentration reaching 90 percent. The lake is referred to as Russia’s biggest salt shaker: Its reserves are expected to last for thousands of years. 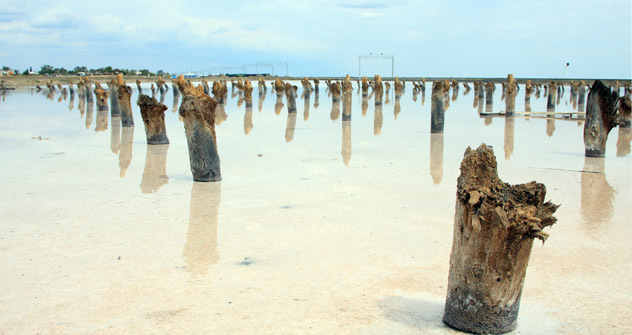 Multiple springs renew the lake’s salt reserves, bringing in some 2,500 tons every day. The Ruins at Arkaim. Arkaim, located in Siberia, is Russia’s Stonehenge. Researchers are still arguing whether it is a ruined town or an ancient observatory. Arkaim is circular in shape and is oriented toward the stars, but archeologists have established that this ancient town is 1,000 years older than legendary Troy. Its mighty walls consisted of wooden structures filled with earthen bricks. The ruins gave rise to many legends. One of them has it that the prophet Zoroaster ended his life here; another says the local Mountain of Reason was visited by Jesus Christ himself, and local beauties believe that one can return their youth by washing one’s face and hands in the Karaganka River, where the old city was located. Arkaim became a Mecca for Russia’s esoteric fans who hold the town to be the source of mystic power and visit the ruins regularly. Shamans and pyramids. The Russian alternative to the Egyptian pyramids is located on the banks of Lake Baikal. A mysterious 333-meter-long (364 yards) wall of cones and pyramids stretches along Cape Rytny. It remains unclear who built them and when they were built. It takes courage and resolve to get to the pyramids, as boats are not allowed to unload passengers there. Locals don’t welcome strangers either, suspecting that they might take some of the place’s sacred power. If you cannot get to the cape itself, you can console yourself by visiting the nearby village of Onguryona, where you can see not just shamans, but also a unique structure: a World War II locomotive turned into a power plant, the only one of its kind in Russia. The Averkina treasure cave. This tourist attraction in the Chelyabinsk region will strike a chord with fans of Robert Louis Stevenson's Treasure Island. According to legend, it is here that Yemelyan Pugachev, the ringleader of Russia’s biggest peasant rebellion, hid his gold. The treasure chests, however, were never found. Instead, scientists uncovered a wooden door and a wooden machine in the cave along with a large amount of bones, including human ones. Tsoi-Pede necropolis. A Russian version of the City of the Dead, Tsoi-Pede is located in war-torn Chechnya. It consists of a watchtower, wall and about 40 crypts. According to one theory, the necropolis was created during an awful epidemic: There were so many victims that burying them became a problem, and those expecting to die were themselves coming to the cemetery to wait for their death here. Historians, however, offer a more prosaic explanation, saying that the cemetery belonged to the nearby village, which had regular conflicts with neighbors. Today, there are two pagan altar pillars at the necropolis, along with protective symbols and crosses, and the image of a human figure is still discernable on the watchtower – presumably St. George. The only problem in visiting the City of the Dead is that you will need a special permit from the Federal Security Service, as the cemetery is on the border with Georgia. The Pole of Cold. This attraction, located in the Yakutian village of Oymyakon, will appeal to those interested in extreme tourism. The average January temperature here stands at -61°C (-78°F), and it can be as cold as -68°C (-90°F). Perhaps, it is the only place on the globe where people live and work in such low temperatures. Santa Claus liked the place so much that he built his residence here in 2004. You can meet him in person at the annual Cold Pole festival. Santa Claus comes to Oymyakon from Lapland to take part in reindeer races and show his skill in jumping over sleighs and underwater fishing. The monument to house slippers. Many Russians wear slippers at home – or tapochki as they are known in Russian. This article of domestic attire is paid tribute by residents of Tomsk. Two bronze slippers have been put on a pedestal on the porch of the city hospital and bears the encouraging inscription: “Feel at home”. Anyone, even those with very big feet, can try on the bronze shoes, which are 32 cm (13 inches) long. Tunguska explosion site. This attraction will be duly appreciated by fans of Star Wars, Secret Materials and paranormal mysteries. This meteorite came from space in 1908, landing in the Russian taiga. The power of the explosion was akin to the hydrogen bomb, uprooting trees over 2,000 sq km, while the blast was heard at a distance of 800 km. Ufologists think the Tunguska Meteorite was not a natural phenomenon, but a spacecraft sent by another civilization. The representatives of traditional sciences stick to a more conservative theory: NASA experts believe that the meteorite consisted of ice, and the molecules of water and the microparticles of ice that formed when the huge mass passed through the dense atmosphere, produced silver-colored clouds in the upper atmosphere – a rare atmospheric phenomenon registered a day after the huge meteorite hit the earth. This opinion is also shared by the Russian scientists at the Institute of Atmospheric Physics of the Russian Academy of Sciences. Some say visiting the explosion site charges people with positive energy and cures them of illnesses. Stalin’s bunker. This is a comparatively recent discovery: For 50 years, the existence of this bunker was kept secret. It is 37 meters deep (121 feet), which is the height of a 12-story building. This is a more secure shelter than Hitler’s bunker in Berlin, which was just 16 meters (52 feet) deep. Stalin’s bunker was built quickly, in a matter of nine months. It is equipped with an automatic air regeneration system and a power plant. It is a multi-story underground structure complete with elevators. On the ground floor, there are a 115-seat hall and a recreation room for Stalin, while premises for guards, storage facilities and technical services are located on the upper floors. Mask of Sorrow. The city of Magadan, despite its harsh climate and permafrost, appeals to those who like unusual places. This is where one of Russia’s most significant monuments is located – the Mask of Sorrow, a monument devoted to the victims of Stalin’s political repressions who served their sentences in the Gulag hard labor camp in Kolyma. The monument’s central part represents a human face with tears dropping from the left eye, while the right eye looks like a barred window. On the back side, there is a crying woman at the feet of a beheaded man on a cross. Permafrost museum. The Krasnoyarsk Region boasts the world’s only permafrost museum. It is located at the site of a frost-effects laboratory. The main attraction is the museum’s underground premises, including halls and corridors located at a depth of 14 meters (46 feet), where temperatures never rise above -5°C (23°F). The walls of the underground corridors are decorated with natural items, such as an icy larch that is 36,000 years old. One of the underground halls holds a capsule with newspapers: It was left here by scientists in 1950, to be opened in 2045. The Mammoth Museum was opened in Yakutsk in 1991. It is the only museum in the world devoted exclusively to mammoths. The museum’s location is logical: in prehistoric times, Yakutia was inhabited by many animals, such as wooly rhinoceros, musk oxen, buffalos, and cave lions. The Yakutsk Mammoth Museum is a member of the International Council of Museums (ICOM). Visitors can also see the underground laboratory of the Permafrost Institute, where the mammoth’s skeleton was kept for a long time after it was found, at a depth of 12 metres. The first mammoth skeleton was found in Yakutia back in 1799.